If you’re searching for a piece of Polaris history, check in at you nearest Polaris snowmobile dealership and order a 2010 Polaris Trail Touring. It showcases the best of Polaris Past and may well be potential Polaris trivia as its Indy chassis gets phased out of the modern Polaris sled line. The Trail Touring survives as one of three remnants of the Polaris Indy series. 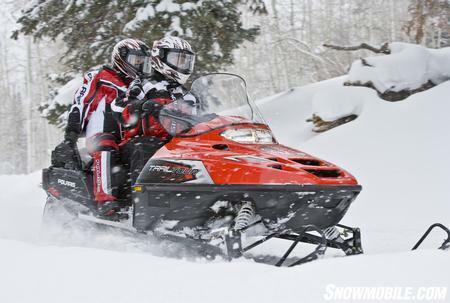 Along with the Trail Touring, other Indy-based Polaris models include the Trail RMK and Widetrak LX. These three models cross over from the Indy to the newest IQ frame and suspensions. The Trail Touring, Trail RMK and IQ-based 550 Shift also retain a 544cc fan-cooled engine derived from a long-standing Polaris/Fuji partnership. For a suggested retail price of US$6,699, the 2010 Trail Touring represents a solid value if you want a snowmobile that can handle everyday riding with either one or two people on board. It is not an exciting sled by any means, but it remains a highly functional, quite versatile and definitely reliable model that will supply years of use. The Trail Touring is based on the elongated Indy aluminum chassis akin to the Trail RMK. While it shares the Fuji-built 550 fan-cooled twin with the Trail RMK — and IQ 550 Shift — there are significant differences in sled personality. The Touring and the powder version RMK may share similar underpinnings but they are outfitted to accomplish very different objectives. The Trail Touring handles two-up riding for weekend getaways. The Trail Touring is a two-up model that shares a “look” similar to its IQ-based siblings, FST IQ Touring and 600 IQ Touring. There is a tall and wide windshield that breaks up cold winds and tosses them over the rider and away from the rider’s hands. The passenger can set a movable backrest for on-trail comfort. Heck, a solo rider can position the backrest for support if need be. You’ll note that there are styling touches at the sides and rear of the tunnel common to all Polaris touring models. The decal detailing, while not exactly the same, shares a family resemblance to fit this last of the Indy chassis model in with the modern IQ-based models. The move up from the Trail Touring to the 600 IQ Touring reflects a US$3,000 upcharge. There are benefits to paying more. There is more power, a cushioned pillow seat and the latest chassis and suspensions, but the Trail Touring is no bare bones sled. The EDGE 136 rear suspension resulted from an evolution of Polaris designs that culminated in a touring ride that provides 13.9 inches of travel. That’s a mere 0.1 inch less than the 14-inches available on the latest IQ 136 Comfort suspension on the pricier 600 IQ Touring. Granted, Polaris fits less expensive shocks to the Trail Touring rear suspension, but we’ve found the older design works quite well considering the level of performance the 550 twin delivers. The Indy chassis Trail Touring is a value-laden snowmobile. Up front the Trail Touring uses IQ-style skis on the older Indy EDGE front suspension. Here again the fan-cooled budget model gets less expensive Nitrex Select shocks. Those shocks control the front end’s 10-inches of available travel — the same amount of travel as the IQ-based models. Of course, the changes from Indy EDGE to IQ front and rear suspensions reflect more than inches of travel. The newer suspension designs have improved geometry and detailed advances in how the front and rear suspensions react to bumps. The IQ designs are better, but you’ll find that the Trail Touring works quite well. 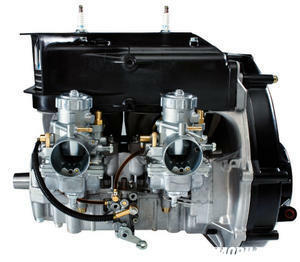 The Fuji-built fan-cooled twin offers above average “driveaway” power for a touring sled. 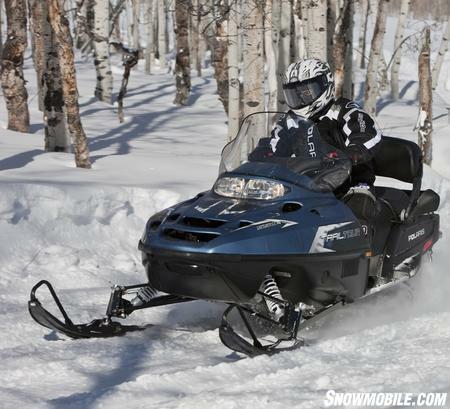 The 2010 Polaris Trail Touring will satisfy value-conscious snowmobilers. The fan-cooled engine, probably in its last cycle of use as a snowmobile powerplant due to future federal emissions standards, remains a strong point. Oh, it’s not going to blow away any other engine in the 2010 Polaris model line up, but it does a very nice job at powering a 537-pound snowmobile from Point A to Point B. With 60-horsepower the 550 twin has good enough top end, but above average drive-off power. The Trail Touring is a serious weekend getaway sled that has been proven ruggedly reliable by rental operators across the snow belt. The fan-cooled twin delivers power to the 136-inch Hacksaw track via Polaris’ proven P85 drive clutch and P2 driven. Stopping power comes from a hydraulic Phantom brake design, which by the way is also used in the more expensive IQ-chassis touring models. As you would expect in a touring model, the Trail Touring features standard key starting and push-button Polaris electronic reverse. In a bid to contain costs, this Indy-chassis touring sled comes only with a mechanical speedometer. You have the option of adding a tachometer, a 12-volt accessory outlet, heated passenger grips (handlebar and thumb warmers are standard), and rearview mirrors. If styling is your thing and you have to keep up with your snowmobiling neighbor, then the 2010 Trail Touring may be too plain, too simple. It is not for the ego-conscious rider. It is after all, the last of the old style Indy models. If you should opt for this value-leader, it makes a positive statement about your recognition of value. It remains a very good snowmobile with one of the most reliable drivetrains in the business, a very smooth set of suspensions, and a price tag that lets you upgrade your end of the day destination hotel!